I haven't had much time lately to generate new posts, but one thing I've noticed lately is that there is a certain anti-vaccine talking point popping up. So I felt it might be a good time to put up an old post again addressing this point. So, without further ado, here is a post from November 3, 2010 talking about why pro-vaccine people are concerned about those who refuse vaccines. It seems that there are people out there who may, perhaps, lack a certain understanding of just how the internet works. They may write some ill-advised comment which draws well-deserved criticism. They might follow this up with additional statements which serve only to attract more criticism, with a big ol' side of humiliation. Maybe they do not realize that in the internet, nothing is truly erased. And so it is that I find myself here, offering up some advice to the poor, self-centered, crass, ignorant folk on the internet. Even though doing so may rob myself and other bloggers the entertainment of invoking the Streisand Effect, I feel that there are those who may benefit from some instructive illustrations. The last Quacktion Figure™ gives me a good excuse to talk about a news item that popped up in my inbox the other day. Well, not so much a news item as someone's notion of a "brilliant" treatment for tetanus. You see, I have some alerts set up looking for vaccine preventable diseases. I take a quick glance at most of the stories and either do a quick tweet or simply archive it for background material for possible future posts. Every now and then, however, there will be something that catches my eye. Some combination of words in the headline or brief blurb snags my attention. That's what happened with one such alert notification on tetanus. While perusing my inbox, what to my wandering eyes should appear but a story titled "Homeopathic Ledum for Tetanus". Do you feel constrained by physics, chemistry and biology? Does the idea of selling Tic Tacs at a 5,000% markup appeal to you? Want to be part of a billion-dollar-a-year industry that rivals Big PharmaTM? Would you like to bang cups of water on a Bible to magically turn them into healing tonics? Well, now you can. Harpocrates Speaks brings you Homeopath! That's right. With Homeopath, you can kiss Avogadro's Limit goodbye! Got the flu? Not a problem for Homeopath. Just eviscerate a duck, drop a bit of its liver in some water, then dilute until only H2O remains. Use the lever on back for magic succussing action to "potentize" your nostrum, then drip it on a sugar pill. Fend off critics with claims that water has memory, but somehow forgets all the poop it's touched. Sure your remedies don't do jack, but who can resist such a "sweet" personality? Table not included. Legal thuggery expansion pack sold separately. Most, if not all, of the vaccines are necessary for public health and prevention of disease. And the effects of the vaccine schedule can be seen from the long history of safe use. Other than that, it's a nice, short summary of some of the concerns about dropping immunization rates. This past weekend, while many were getting together with family and friends, sharing in feasts, watching TV and spending too much money on holiday shopping, a story erupted among skeptic circles. Like many such matters, it began with the actions of an apologist for what is, at best, questionable science and at worst rank quackery. An individual, Marc Stephens, put himself forth as representing one Dr. Stanislaw Burzynski. Mr. Stephens, you see, took it upon himself to defend the reputation of the good doctor, going so far as to rattle his saber and issue legal threats to Andy Lewis (aka Le Canard Noir) of Quackometer and teenage skeptic Rhys Morgan. They were to take down their less than complimentary writings about Dr. Burzynski or face a libel suit. We've seen this kind of thing before. Clouds gather on the horizon. 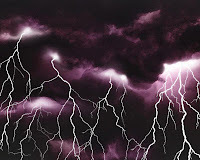 Thunder, like deep, rolling laughter, rumbles forth. A storm is gathering. Watching the approach from a vast, flat plain, a lone figure stands, clad all in maille and wearing the livery of his liege lord, shouting defiance to the heavens while brandishing a long metal pole. Marcus had always envisioned himself a great warrior, yet his simpleness of mind was apparent as he stood on that plain, watching the storm draw nearer and nearer. Behind him rose the small, yet ornately decorated manor house of his lord, Stanis, whose wealth was accumulated through false promises to those desperate enough to turn to him for succor. The manor was surrounded by open land sloping gently down to the building. Its moat was filled with the dreams and hopes of the sick who sought relief at its doors. Lightning flashed, arcing through the air between cloud and servant, drawn to the idiotic pomp enshrouding Marcus. Bolt after bolt zigged and zagged to the metal man, and every one then being drawn to the manor house and the lord watching from its lone turret. 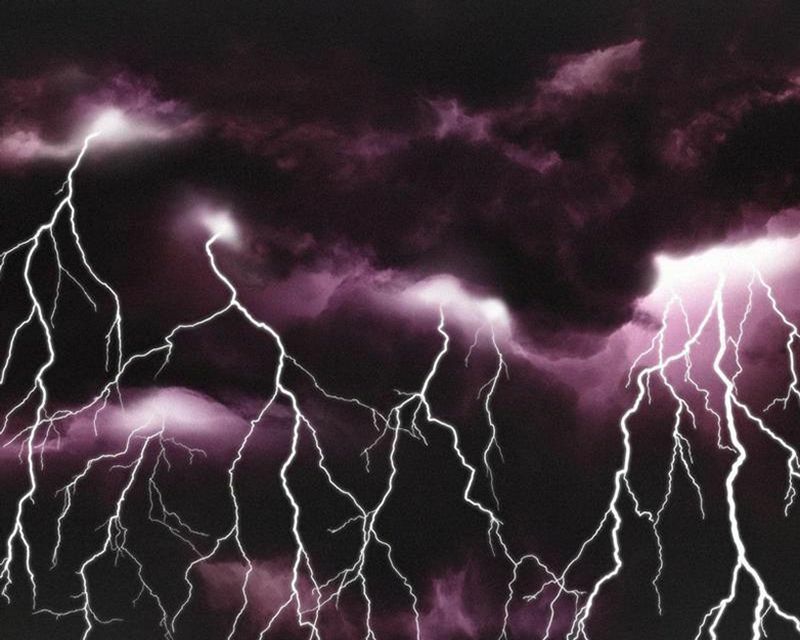 The more Marcus shook his fist impotently at the sky, the more frequent and powerful grew the display of light. He would as soon try to silence a speaker of truth as stop the storm about to plunge him, and his Stanis, under a flood. To put this all in context, check out the posts linked by Liz Ditz, Josephine Jones and Anarchic Teapot. For how the storm started, check out Rhys Morgan and Le Canard Noir. And if you like this little story or think that the tin man needs some more well-directed shocks, please consider sharing this on Twitter. Turning on the news this morning, I was greeted with a story that caught my ear. 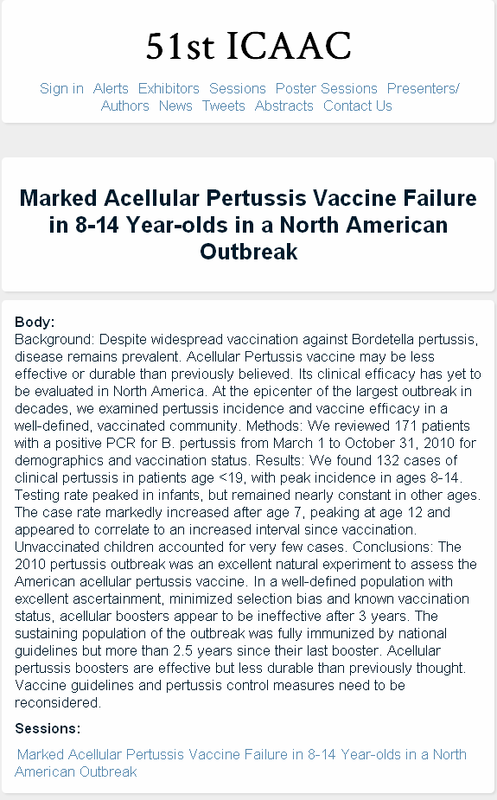 Published online, ahead of print, a new study in the journal Pediatrics, "Varicella in Infants After Implementation of the US Varicella Vaccination Program", looked at the incidence of varicella (chickenpox) among infants under 12 months of age. The varicella vaccine was approved in 1995 and is recommended for all children aged 12 months to 12 years. It is a "live" virus vaccine, meaning that the vaccine uses intact, though weakened, virus particles that grant immunity without causing full-blown disease. Vaccines of this sort are generally more effective than "killed" virus vaccines, which only use part of the virus. Because of the approved age range for the vaccine, it does not provide direct protection to infants under 12 months of age, but it can provide protection through herd immunity. Several weeks ago, from October 20-23, Boston, MA played host to the 49th Annual Meeting of the Infectious Disease Society of America (IDSA). This conference gives physicians, scientists and other health care professionals an opportunity to continue learning about the pathophysiology, diagnosis, treatment and prevention of infectious diseases, as well as to connect with colleagues from around the country. The conference presents speaker sessions, poster presentations, exhibits and networking opportunities. One of the poster presentations at IDSA covered the measles outbreak in Minnesota earlier this year. Presented by several members of the Minnesota Department of Health (lead author, Pamela Gahr, MPH, Cynthia Kenyon, MPH, David Boxrud, MS, Karen White, MPH and Ruth Lynfield, MD) and Hennepin County Human Services and Public Health (Erica Bagstad, MS, MPH), the poster offered a closer look into how and why measles was able to spread, as well as insight into some of the difficulties involved in investigating and controlling the outbreak. Have you ever wanted to heal people, but found the complexities of medicine too much to handle? Thought how nice it would be to have a single cause of all diseases? Do you think of how nice it would be to fleece people using a made-up device that doesn't work as claimed, but find yourself bound by your own ethics and a desire to do no harm? Well, fret no more. Harpocrates Speaks brings you Chiropractor! That's right. With Chiropractor, you can dream up your own theory of disease based on non-existent spinal displacements and pinched nerves. 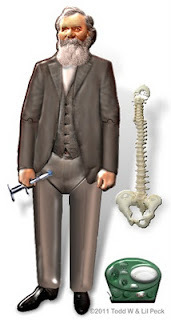 No matter how unconnected with the musculoskeletal system, you can claim to cure anything with a simple shove of the vertebrae using your Chiropractic Adjusting Tool (C.A.T.). Kid have an earache? No problem! Don't worry that no auditory nerves pass through the spine; just a quick twist of the neck is all it takes. Diagnose all manner of diseases using your patented e-meter. Measure the non-existent "innate intelligence" and interpret the readings to mean anything you want! And with the flexible model of the human spine, you can demonstrate how misalignments of the vertebrae look so scary to remind them that regular treatments are needed. Keep 'em coming "back" for more! 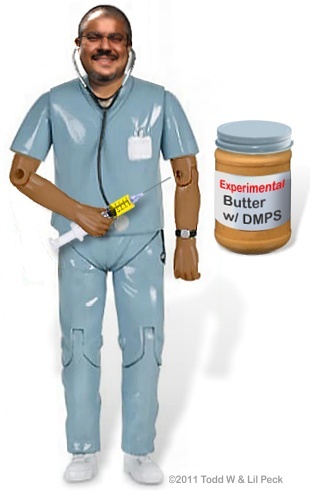 Malpractice insurance to cover adjustment-induced stroke sold separately. Recently, the American Academy of Protecting Kids' Health (AAP), a physician group whose goal is to promote practices and education to keep children healthy, wrote a letter of protest to Melting Airlines' decision to run a misinformative ad about influenza. The ad, paid for by the National Vaccine Misinformation Center (NVMC), discusses what on the surface appears to be good advice for avoiding the flu. The AAP disagrees with the ad because rather than directing people to a web site with accurate and truly informative information, it drives people to the NVMC web site, which is a cesspool of rank claptrap. A couple weekends ago, something of a firestorm erupted among skeptical bloggers. Namely, the news about parents sending pox-laden lollipops through the mail. It was covered by Mike the Mad Biologist, Emily Willingham, Reuben, Tara Smith, Orac and Phil Plait. Largely, the various bloggers, myself included, condemned the parents in the original story because they were knowingly sending infectious material in the mail. Some folks in the comments of the various articles made the observation that every day, people lick envelopes, handle packages in perhaps less than sterile conditions and so, perhaps unwittingly, leave unintended presents for the recipients, not to mention the delivery personnel. How is that any different from what these parents have done? Do you have a child with autism? Know someone with cancer? Do you wish there were some magic bullet to use instead of costly behavioral therapy or intense regimens of surgery, radiation and chemotherapy? Would you like to use experimental treatments outside a clinical trial setting? Are pesky regulations keeping you from doing any of this? Well, now you can change all that. Harpocrates Speaks brings you Chelation Therapist! That's right. With Chelation Therapist, you can develop your own evidence-free therapies that are one-size fits all! Want to boost the immune system? Just inject a little urine. Autism? Use your very own experimental chelation cream! Breast cancer? Chelate! Prostate cancer? Chelate? Lung cancer? Chelate! Chelate! Chelate! And should the local medical board look askance at your maverick ways, just use your political influence to change the laws and hamstring those "rabid dogs"! Easy as buttering up some bread. 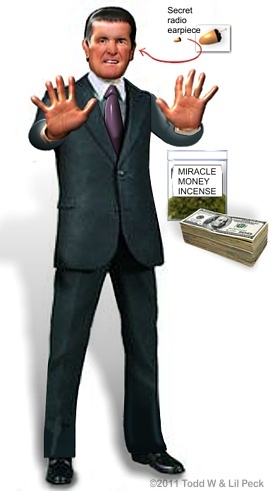 Are you a medical doctor, tired of the drudgeries of trying to actually heal people? Have you ever thought, "Wouldn't it be nice if I could just make people think they were feeling better without doing all that messy real medicine"? Does the idea of raking in the dough and building a mass media presence by spewing mindless pablum and misusing terms like "quantum" appeal to you? Well, now you can do all that and more. Harpocrates Speaks brings you Ayurvedic Guru! That's right. With Ayurvedic Guru, you can tell people to take herbs instead of real medicine. Your messages of love and peace will make people feel better, even while their conditions worsen. Worried about pesky questions from skeptics? Just wow them with your keen grasp of quantum mechanics. 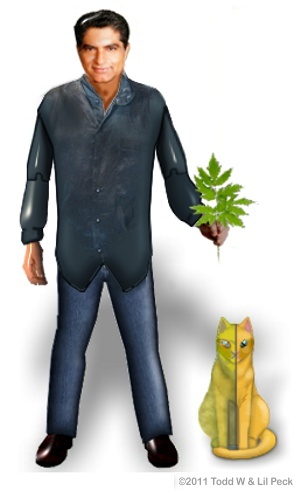 Present your very own Schroedinger's cat to prove the truth of your quantum woo. Sure, you might not convince people that know better, but your adoring fans will lap it all up! Miniature library of fanciful books, CDs and videos sold separately. If you follow me on Twitter (and if you don't, why aren't you? ), you have likely already heard about a PSA put out by the National Vaccine Information Center (NVIC) and Mercola.com, two slick anti-vaccine organizations. The PSA is being run on Delta Airlines flight. You can read more about it at Skepchick and Respectful Insolence. The Skepchick article includes steps you can take to combat the propaganda, including a link to a petition to get Delta to stop showing it on their flights. The video is available on YouTube (Update: It looks like NVIC removed the video at that link, but it is still up here and here [Update: looks like it has been removed from Facebook, now, too]), but cannot be embedded. Comments have also been turned off, perhaps to avoid inconvenient critiques from science-minded individuals. 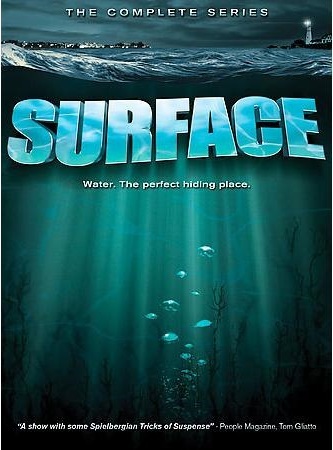 On the surface, it appears to be pretty good advice, so why all the fuss? Because the PSA includes some iffy information and, more importantly, directs people to the NVIC web site, which is rife with misinformation and distortions of fact. Ever wanted to enjoy the adoration of tens of others? Had an idea for a new product to patent, but had pesky competitors that needed discrediting? Have you ever dreamed of creating a controversy where there was none? Have you thought that violating research ethics would be a quick way to accomplish all this, but never had the narcissistic chutzpah to pull it off? Well, now you can. Harpocrates Speaks brings you Anti-Vaccine Researcher! Now you, too, can fake data for a paper and have it retracted. With Anti-Vaccine Researcher, you can pay children £5 each to bleed 'em dry! Cry, "Conspiracy!" to your adoring fans and hold your own medical practice board hearing where you can choose not to present any evidence in your own defense! Self-aggrandizing book of fiction sold separately. A while back, JB Handley made a deal. He bet that if the author Sullivan over at Left Brain/Right Brain was not Bonnie Offit, wife of Dr. Paul Offit, he would never write about Dr. Offit again. Readers, head on over there and let yourselves be heard. Be sure to save a copy of any comments you leave, which you can post here. If you do comment there, however, be sure to follow their commenting policy, so that they have no real excuse to moderate your comment out of existence. The picture should show the individual virus or bacteria and must be your own; no third-party pics, please. Photos are preferred, though digital artwork depicting the particles/organisms works, too. The images should be something similar to what one can find on the Public Health Image Library (which I could use, but would prefer to get pictures over which I can have full use rights). If you have images for which you are willing to give me the rights to use for a project, please contact me at todd [at] harpocratesspeaks [dot] com. 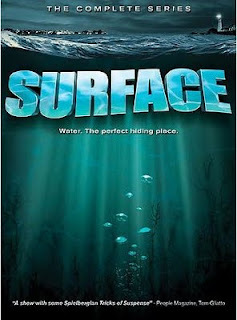 Deadline is October 31, 2011. Credit will be given, though no remuneration will be provided. The other day, I was reminded of something that happened to me many years ago, when I was a little younger and much more naive. At the time, I was living in Japan and had to walk pretty much everywhere I wanted to go. That put me outside for rather extended periods of time pretty frequently, which also meant that I was in the rain for longer stretches than I otherwise would have been back in the United States, where I drove anywhere I needed to go. It also happened that I was, at the time, rather enamored of the New Age-y pseudo-Celtic mythology, which revered nature, espoused spirit guides and purported to teach the follower the means to manipulate energy to influence the world around us. I had come to these beliefs in part out of a sense of disenchantment with my Christian upbringing and organized religion in general, as well as a youthful conceit that I could somehow control the uncontrollable. These things came together one spring day, as I was heading, if I recall correctly, to university. In the United States, today, the second Monday in October, is Columbus Day, a holiday recognizing the landing of Christopher Columbus on the shores of the New World. On October 12, 1492, Columbus arrived landed on the island now known as San Salvador, in the Bahamas. Many celebrate the day as the discovery of America. A popular, though erroneous, belief is that Columbus flaunted common thought that Earth was flat, venturing out across the western waves to prove that the planet was, in fact round, and he is often held up as a model of how one man with conviction can prove not just popular opinion, but science itself, wrong. Portrait of a "brave maverick". In fact, cranks of all stripes tend to bring up Columbus to support their fringe ideas, secure in the belief that they will be vindicated. Perhaps if they knew a little more about Columbus, they might not be quite so eager to compare themselves to him. Over the weekend, I saw a news story from India Express on the measles vaccine in that country. Titled "Measles vaccine protects only 1 out of 5 children in Delhi: Study," the article discusses a recent study that found poor efficacy for measles vaccine among Indian children after a single dose. Since the news article did not provide a link to the study, I had to poke around a bit to find it. Appearing in the Indian Journal of Medical Research, Immune response to second dose of MMR vaccine in Indian children (PDF), by Sunil Gomber, Shilpa Khanna Arora, Shukla Das and V.G. Ramachandran, examines the seroprotection of MMR against measles, mumps and rubella, as well as the immune response to a second dose of MMR. Unlike in the United States, the MMR is not part of the national recommended immunization schedule. The Indian state of Delhi, however, does include a single dose of MMR given at 15-18 months of age. Before diving into the study, we need to get an idea of the state of things in India. A friend of mine, we'll call him Mr. T, was recently the target of the negative attentions of a bully, we'll call him Mr. BS. You see, Mr. BS said some defamatory things about some people on twitter. Mr. T didn't take kindly to it (after all, he pities the fool that bullies others) and called Mr. BS on it, going so far as to write up a blog post, stating facts about the exchange, as well as some additional information about Mr. BS. This ruffled Mr. BS's feathers, but rather than doing what a normal person would do and contacting Mr. T privately to work out the disagreement, Mr. BS published Mr. T's work address, phone and e-mail address on Twitter and in the comments of a news article, as well as blast e-mailing just about everyone at Mr. T's place of employment, threatening law suits if Mr. T didn't back down. Imagine for a moment a purveyor of health and science information. The don that controls things on his street comes by and tells him to pay up or he's gonna break some kneecaps. In the situation with Mr. T, the "payment" is to cease all use of social media on topics of public health and instead of breaking kneecaps, he stands to lose his job. Why such a strong reaction? Because Mr. T's overseers viewed Mr. BS's sabre rattling as enough of a nuisance that they just wanted to avoid any legal issues altogether, thinking Mr. BS more of a tiger, when in reality he's closer to a gnat. The Minnesota Department of Health reported on August 19, 2011 that there are two new cases of measles in that state. The index case is a 12-month-old infant who was infected while on a trip to Kenya. The second case is a 15-month-old child who acquired the measles virus after exposure to the first infant. Neither child, both residents of Dakota County, had been vaccinated against the disease. Both children have been hospitalized. The Shakopee Valley News and the Columbus, IN paper The Republic, as well as news station KARE11, report that the 12-month-old child is in critical condition. These cases are not connected with the measles outbreak in Hennepin County earlier this year, which resulted in 21 cases, almost all unvaccinated, with 14 hospitalizations. Although both children were unvaccinated, it should be noted that they are right around the age when the first dose of MMR is recommended, according to the CDC schedule (PDF). Sources do not report any reason for the infants being unimmunized; it may be that the parents simply had not scheduled the appointment yet. 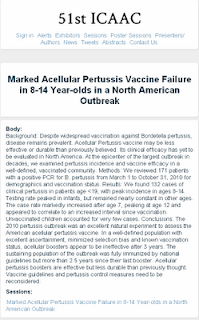 It is also possible that the parents had avoided the MMR due to misinformation promulgated over the past several years in Minnesota by anti-vaccine activists which has negatively impacted herd immunity. I will try to keep an eye on this situation, in case any further cases arise. UPDATE: The 12-month old who has been hospitalized since August 10 appears to finally be recovering. Measles left Mahi Abdallah susceptible to a secondary pneumonia infection that very nearly killed him. He has been cared for in the pediatric ICU at Children's Hospital in Minneapolis. His mother, Nuria Koto, had planned to have him vaccinated against measles, but he was only 9 months old when the family left to visit Kenya. She thought he was too young to receive the MMR (typically recommended to first be given at 12 months) and was unaware of travel recommendations that allow for administration of the vaccine as young as 6 months old. I urge those considering whether or not to delay vaccinating against MMR to read his story. No parent should have to go through this, and my heart goes out to Nuria, Mahi and the rest of their family. When is it okay to lie in a study? 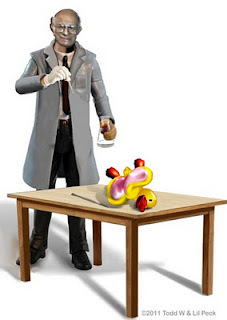 When someone volunteers to be a research subject, whether it is a psychological study or clinical trial for a new drug, a corporate study or student project, what are the limits on just how much you can deceive the person? What aspects of the deception should be disclosed, and which are okay to keep hidden from the subject? If you do disclose the deception, do you need to be up front about it? Can you wait until after the study is under way or even completed? The easy answer is that researchers shouldn't lie or mislead study subjects. Lying is wrong, right? Besides, lying could have a very big impact on whether or not the subject participates. And then there are the psychological impacts of being lied to. Just look at the famous (infamous) Shocking Experiment by Stanley Milgram. Most people learn about this in high school social studies, but for those who may be a bit fuzzy or haven't heard about it, a quick summary. 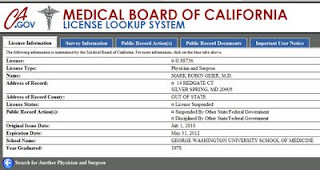 With all of the various states that have licensed Dr. Mark Geier and the rising tide of suspensions of those license, I thought it may help to provide a map, visualizing which states have suspended Dr. Geier's license to practice medicine and which states still allow him to see and treat patients. So here we go. 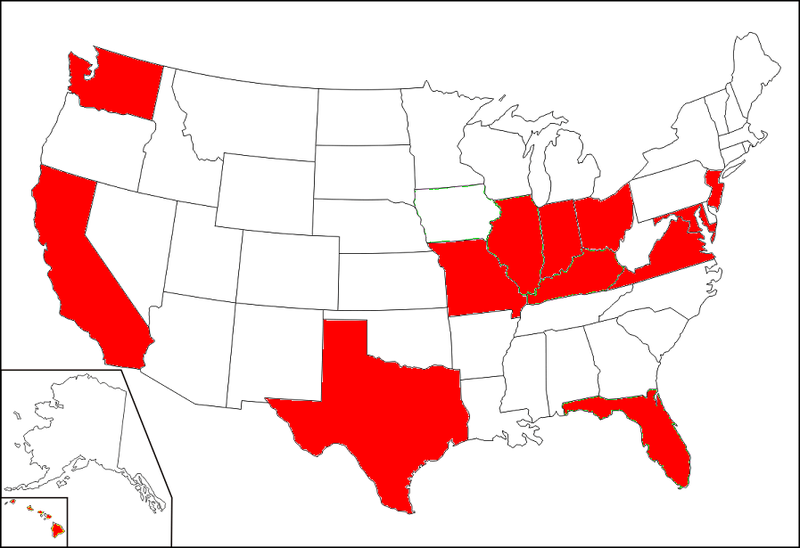 Red states are those which have stopped Dr. Geier from misdiagnosing children with precocious puberty and subsequent treatment with the chemical castrator, Lupron, and the green states are those which have yet to take action to bar him from potentially harming any more children. 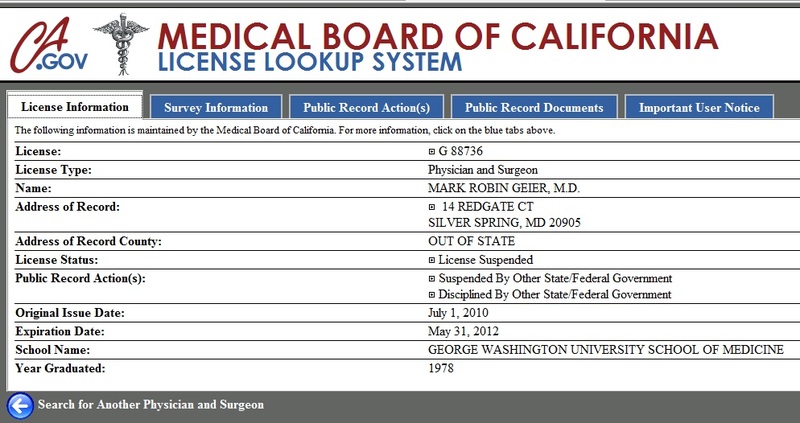 Another brief update on the status of Dr. Mark Geier's licenses to practice medicine in various states. It has come to my attention that a fifth state, California, has now suspended Dr. Geier's license to practice in that state, effective August 3, 2011. This comes following suspensions (in chronological order) in Maryland (PDF), Washington, Virginia and Indiana (PDF). He still has licenses to practice in Florida, Hawaii, Illinois, Kentucky, Missouri and New Jersey, although it has been reported that his license in Illinois is also under review for possible suspension. There have also been rumors that Missouri will follow suit. Five dominoes have fallen, six remain. Among the vocal anti-vaccine arm of the autism community, a very common story is that of a parent who brings their child to the pediatrician’s office for their routine shot, and then, BAM!, like a bolt of lightning, the light goes out of their child’s eyes and they regress into autism. Right then and there, the parent decides that no vaccine needle will ever touch their precious, “broken” child, nor indeed any of their children, ever again. Not only that, but they may be so affected by the experience that they encourage other parents to forgo immunizations for any child. At least, that’s how the story goes. More often, the timeline is more gradual, and the emergence of an anti-vaccine perspective slower, building as they read more and more material which plays on their fears and appears to confirm what they suspect: that each and every vaccine on the recommended schedule is nothing but a ticking time bomb waiting to steal children from their parents. Something that has been noted here and elsewhere over the years is that anti-vaccine activists generally play rather loose and free with facts. They have this tendency to misrepresent reality in a way that suggests support for their opinions, and sometimes they even downright fabricate "facts" that have no basis in the real world. Take the long-debunked claim that vaccines contain anti-freeze. (They don't.) Because their goal is to stir up fears about vaccines, they latch onto scary-sounding chemical names and equate them with all manner of ills. Where nuance is called for, they resort to hyperbole. Their goal is fear, not truth. One of the arguments that I hear fairly often regarding the recommended childhood vaccinations is that the government has no right to force someone to undergo a medical intervention or procedure, that personal liberties trump concerns about public health. This got me wondering how those who are opposed to vaccines in some regard and believe that vaccines should not be "forced" upon people feel about how the government should respond to someone who has a highly communicable disease. An argument that is heard with near light speed rapidity in discussions of anti-vaccine sentiments is "I'm not anti-vaccine. I'm pro-safe vaccine." This typically comes either immediately following or preceding a diatribe about how evil and dangerous vaccines are. The speaker/author generally declaims how every vaccine is dangerous and God forbid they should ever subject their child to such monstrous poisons (in their eyes). Present them with a series of vaccines and, more likely than not, they will describe some issue which, in their opinion, makes the vaccine "not safe," rendering it anathema. While they are not, in their words, "anti-vaccine," they are "anti-all-currently-used-vaccines." Whatever. Tomato, tomahto. I'm not going to argue semantics. Instead, I'm issuing a challenge to anyone who says they are "not anti-vaccine, but pro-safe vaccine" (as if those who support vaccines are pro-dangerous vaccine). It is really a simple thing: don't just talk the talk; walk the walk. Notwithstanding the provisions of this section a child shall, upon written request of a parent to the school, be admitted to school. That doesn't sound too bad, right? I mean, parents should be able to write to a school and have their child admitted. After all, the education of children is not only a requirement, but is something that benefits everyone. Everyone should have the opportunity to obtain a good education, to learn valuable skills and expand their knowledge so that they can become useful, contributing members of society for the good of themselves and the community in which they live. I learned about the following story from Phil Plait over at Bad Astronomy. The video is one of many stories you'll find at Shot by Shot. This is too rich. As some of you may know, there is a group of viruses and bacteria on Twitter that are part of a group known as the #pathogenposse. One of those, @Rubeola, sent a tweet to a, for lack of a better term, rock band known as The Refusers. As Orac has pointed out over at Respectful Insolence, The Refusers are unapologetically anti-vaccine. They liken Big PharmaTM and anyone who supports vaccines to Nazis. They equate vaccines with toxic sludge. They make absolutely no bones about it that they hate, hate, hate vaccines and believe them to be part of a grand conspiracy to maim and kill the populace. So what did @Rubeola have to say to them and how did they answer? That's right. The Refusers, a group adored by anti-vaccine groups like Age of Autism, appear to be quite proud that they are helping a dangerous virus spread. Launched in 2000, the GAVI Alliance is a global health partnership representing stakeholders in immunisation from both private and public sectors: developing world and donor governments, private sector philanthropists such as the Bill & Melinda Gates Foundation, the financial community, developed and developing country vaccine manufacturers, research and technical institutes, civil society organisations and multilateral organisations like the World Health Organization (WHO), the United Nations Children's Fund (UNICEF) and the World Bank. Their goal is to provide rapid and affordable access to vaccines for poorer nations. With the conference, they are trying to raise funds to be able to provide immunizations for approximately 243 million children in poor and developing countries. By immunizing against pneumococcal disease, Hib and rotavirus (all of which are prominent causes of child mortality in the target countries), among other diseases, GAVI hopes to reduce the number of deaths caused by these diseases. But it appears there are some people who aren't too happy about that.